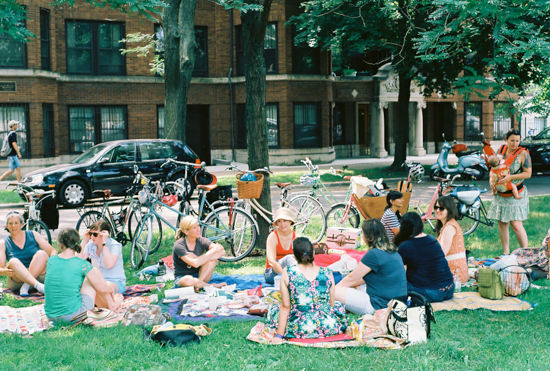 A couple of Sundays ago, my Women-Who-Bike and Brunch group met up for a lovely picnic at the Logan Square Farmer’s Market. 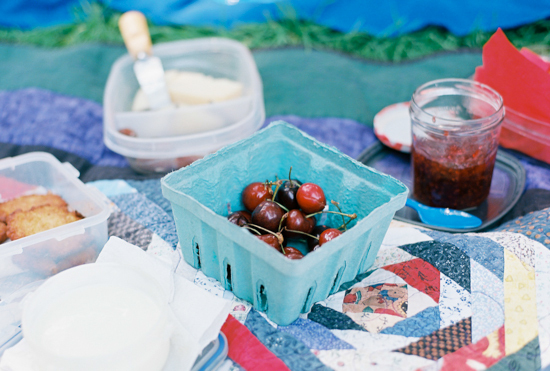 Summer picnics are the best – I love sampling all the delicious food everyone brings. My friend Ash, who writes about some of her bike adventures at One Less Minivan, was there with her two daughters and badass bike set up. 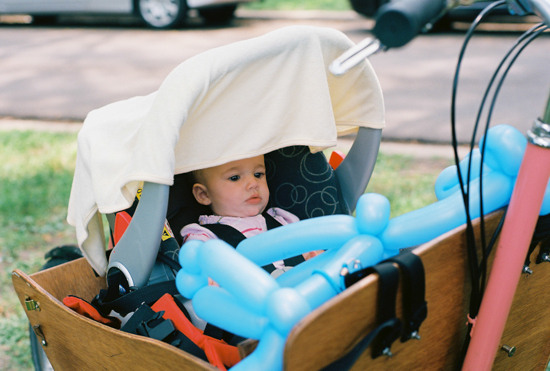 She has a Joe Bike bakfiets fitted with a baby carseat in the front and a child’s seat in the back. Baby is strapped in and ready to go! 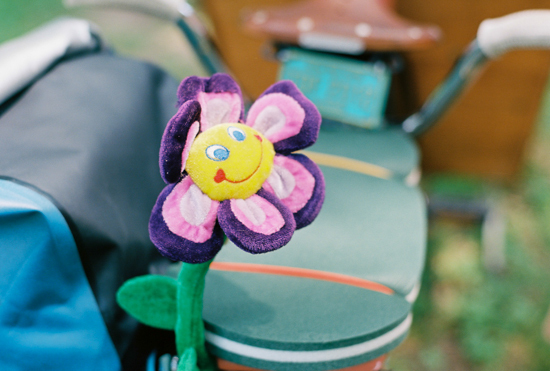 A happy flower smiles at following drivers. Thanks so much to everyone for your support this week! Every comment and email means a great deal to me. I have not told anyone outside of my bicycling circle about the hit and run. I want to avoid hearing – from now until the end of time – “I can’t believe you’re still riding your bike” and “OMG be careful!! 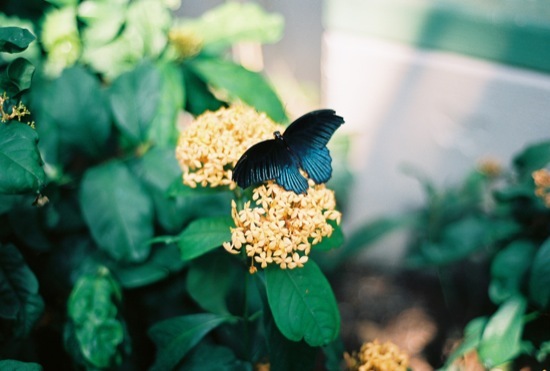 !” This would come from a place of kindness and concern, but I just don’t want to hear it. So I am very grateful for all of you and for my women-who-bike group: people who really get it. 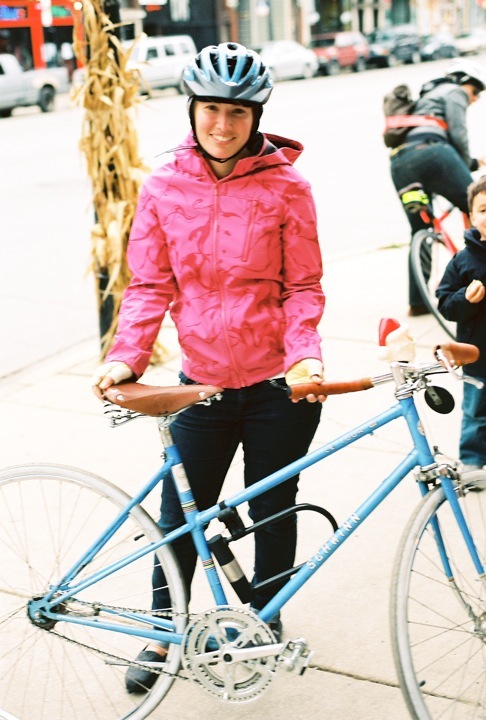 Here are some photos from Decembers Women-Who-Bike Brunch a couple of weeks ago. Strong, fabulous women who are leading the charge and having fun doing it. 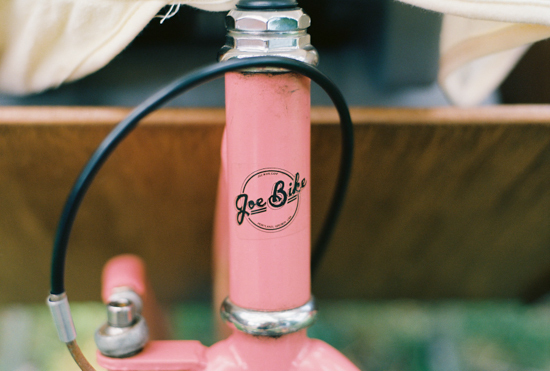 If you are in Chicago and would like to join our Women-Who-Bike brunches, please email me at LGRAB@letsgorideabike.com. If you’re not in Chicago, I encourage you to join – or start! – a local social bike group. The benefits of community cannot be understated. 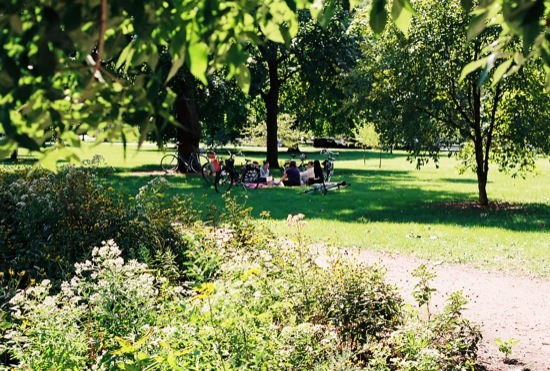 In September, the women-who-bike brunch group picnicked for the final time this year. Lucky for us, the weather was perfect. 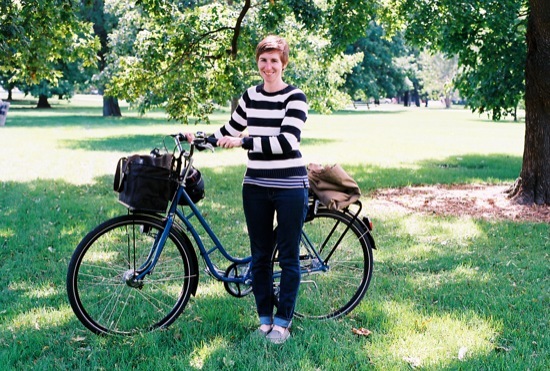 Here are some of the cool women-who-bike and their trusty steeds. …on our way to check out the final day of the “Bikes! 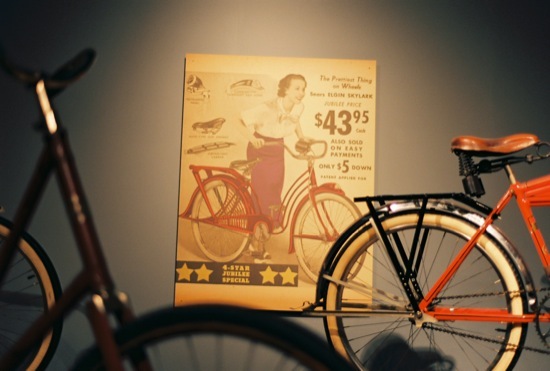 Green Revolution” exhibit, which I originally blogged about last spring. 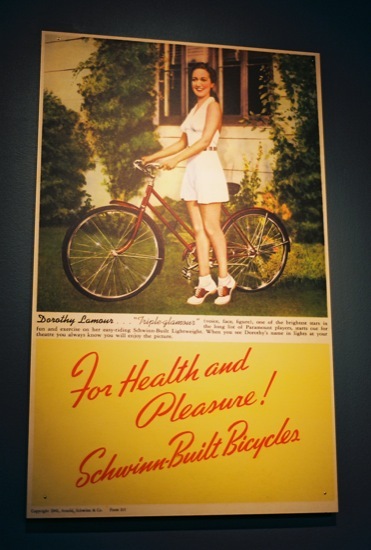 I dig the old school cycle chic posters. The next brunch will be this Sunday with special guest Trisha! :-) Email LGRAB@letsgorideabike.com if you’re interested in joining us. 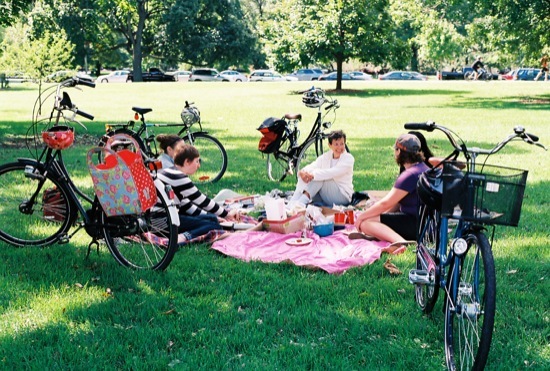 For our August brunch, the Chicago Women-Who-Bike gathered in Lincoln Park south of the zoo for a scenic picnic. There were lots of cool ladies with cool bikes. 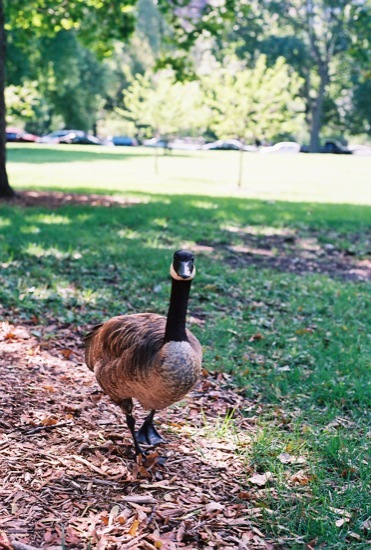 This month, kids were specifically invited – and enjoyed the nearby petting zoo after brunch. Happily for them, there was plenty of grass to run around on and trees to climb. Their moms were rocking some VERY cool multi-passenger bikes. This Bike Friday Two’sDay Tandem is an awesome little machine. You can read more about it on One Less Minivan. Then there was this chic black Madsen with a heavy duty front rack. 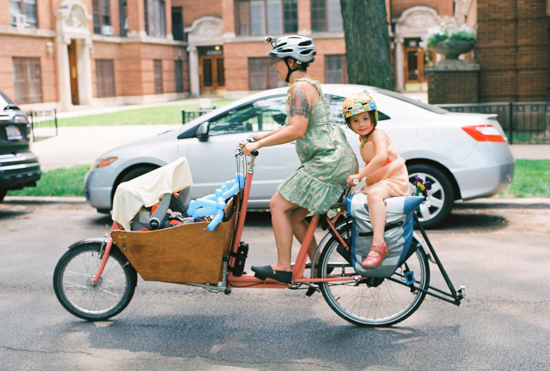 This WorkCycles Bakfeits regularly carries three boys. Read more about it on Chicargo Bike. Betty Foy looked on with respect and admiration. These women and their bikes are way badass. If you are a woman in Chicago interested in joining the group, you are very welcome! Email me at LGRAB@letsgorideabike.com for details. 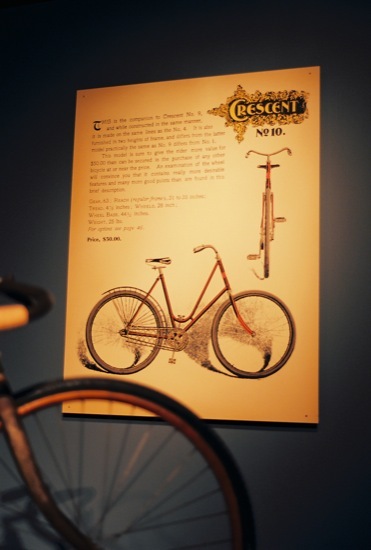 The next brunch will be Sunday, September 9, at the Nature Museum to check out the final day of the Bikes! The Revolution exhibit. 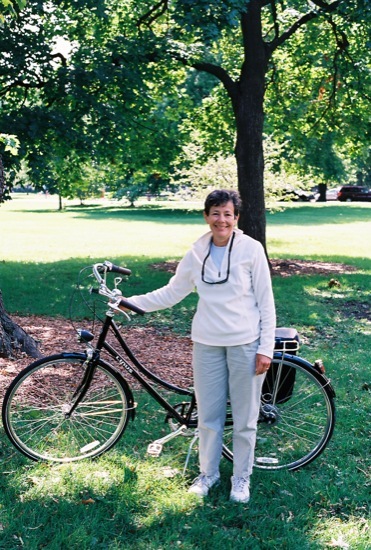 On July 1, the Chicago women-who-bike met for our monthly brunch. A small group made it downtown for the 90+ degree day. We picnicked in Grant Park, near the famous Buckingham Fountain. Here is Jessica and her colorful Specialized Globe. The blue wheels came with it. Chika and her blue Linus Dutchie 3-speed. 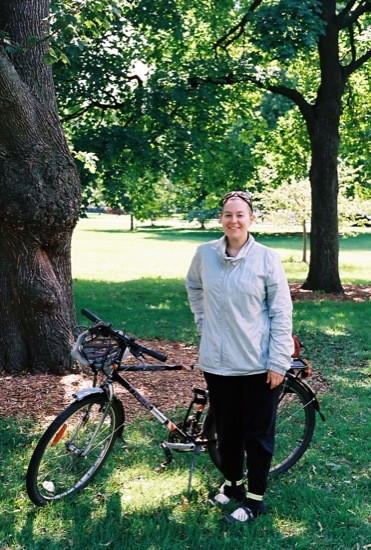 I was with Chika when she bought the Linus from J.C. Lind Bikes – more on that selection process soon! Michelle and her black Linus Dutchie 8-speed. Michelle writes the informative and influential blog, Bike Walk Lincoln Park and I was so happy finally to meet her in real life. Megan and her Gary Fisher Simple City (no longer made). I love how her creamy linen and seersucker outfit matched her creamy bike. Sara and her blue Pashley Poppy from Boulevard Bikes. She loves this bike, since upgrading from a Jamis Commuter. Me and my beloved Rivendell Betty Foy. With my long dress pinned up for biking. After a couple of hours, our sunny morning became overcast and thunder rumbled in the distance. I was headed to a nearby theatre to see the Paris Opera Ballet perform again – I made it inside just in time to escape the storm. When I emerged hours later, the weather was perfectly calm for my bike ride home. Any women in Chicago who are interested in joining the brunch should email me at LGRAB@letsgorideabike.com. We always meet the first Sunday of the month. The first Sunday of June was an absolutely gorgeous Chicago day. 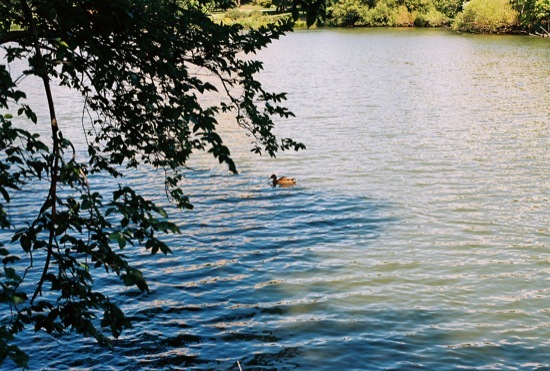 The women-who-bike met for a picnic by the lake. Much fun was had! 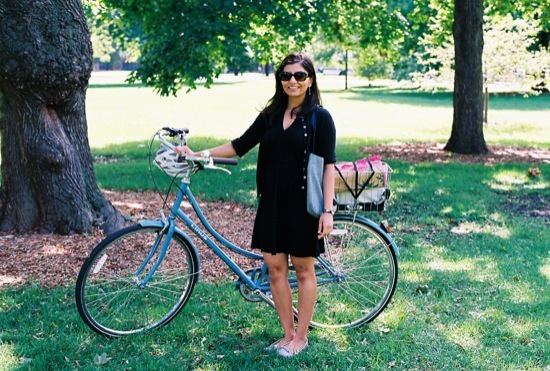 Check out all the awesome women and their bikes! Sara with her new Pashley Poppy and amazing red pants. 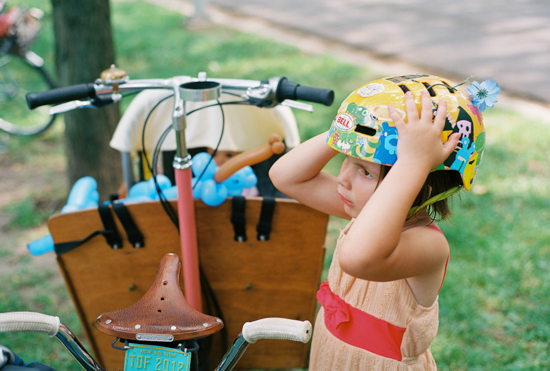 Chika – her first time biking in a dress! Jen and her badass bakfiets. Amy is serious business. :) Preparing for her first RAGBRAI this year! Seri rocking the all black ensemble and preparing for her fourth (!) RAGBRAI. Stefanie shows how to do summer blues! Araidia and her adorable gingham skirt with clever leggings. Me and Coco. Read more about biking in this long dress. Our beautiful patch of Chicago, in the shade of a majestic old tree. 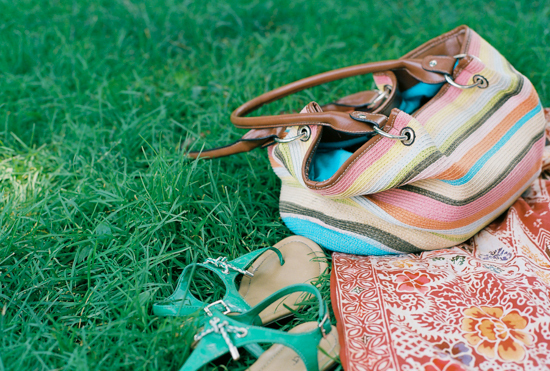 If you’re a woman in Chicago, join the next brunch – a picnic in Grant Park downtown! Sunday, July 1, 10:30 a.m. Email LGRAB@letsgorideabike.com for the details. Today I developed a long-forgotten roll of B&W film and discovered the pictures from October’s women-who-bike brunch. If anyone was wondering why I never blogged about October’s brunch, that’s why. At this brunch we had special guests from Portland: April and Shawn from the Urban Adventure League. They were at the end of a long bike tour that took them from Portland through Vancouver, Montana, Minnesota and finally Chicago. Shawn is also the writer of the comic Ten Foot Rule, among other publications. Overall, our group size was about 30 people, all at one long table. Special thanks to our excellent waitress, Jessica, for taking such good care of us. Molly and her husband Piet joined us while visiting Chicago from Ann Arbor, Michigan. You may remember both of them from their Summer Games participation and especially Molly from her 2010 Roll Models profile. After brunch, we spent time outside – as always – talking about bikes. I like how April strapped her Kate Spade bag to her front rack. But she soon went back to her own cute orange ride. The day was a little rainy and I saw lots of different rain coats. I particularly like this teal one! Jenny showed how casually stylish a skirt with sneakers can look. And Megan wore cool red sneakers! This is only a small sampling of the great group of women who came out. 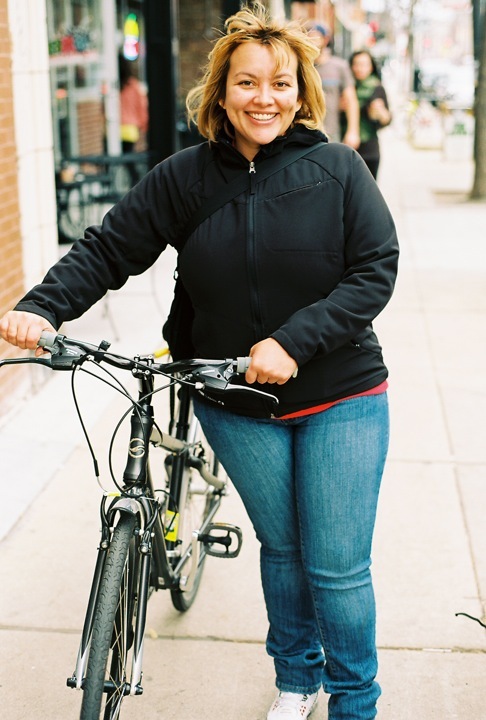 If you’re a woman and in Chicago and you bike (or simply want to learn more about biking! ), email me at LGRAB@letsgorideabike.com to be added to the list. 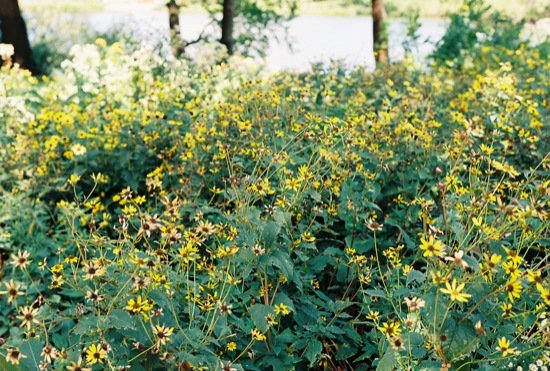 Our next brunch will be Sunday, June 3rd – a picnic on the lakefront. On Sunday, the Chicago Women-Who-Bike gathered for our April brunch. Although we had to cancel a planned picnic at the last minute due to the weather (never trust a Chicago forecast), a great group of both regulars and first-timers gathered at the back-up location. Beth (on the left below), a first-timer, is preparing for a charity century ride in June and learning how to use clipless pedals. My hat is off to her! Those are two bikey things that I have never tried before. I love how her Fuji manages to be both utilitarian and attractive while primarily being sporty. You can follow her adventures at YAY BETH!! (tagline: “cheer me on, damn you.” ha!). Jenny (on the right below) is a regular and she rides the most lovely Globe I’ve seen. The Carolina blue frame and cream tires are so gorgeous, right? Especially with her brown leather boots. I’m impressed by how far the Globe has come as a utilitarian and classy bike in the past few years. 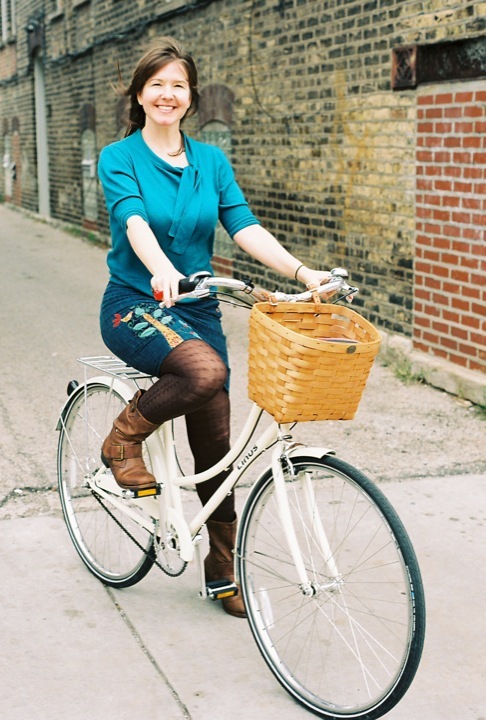 Araidia and her lovely vintage Raleigh are regulars. 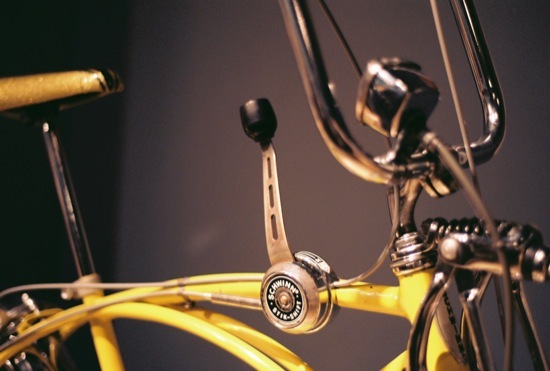 I swooned over her shellacked cork grips for a bit (she shellacked them herself and they look so much nicer than my pre-shellacked ones) and we noticed that our 3-speed Sturmey Archer shifters are almost identical, even though hers is over 30 years older than mine. Ariadia designs and creates beautiful Love Letter Slips and we made plans to go thrifting together soon! Chika (on the left below) joined the group for the first time. I was amazed to learn that we both grew up in North Carolina, went to the same college (the University of North Carolina at Chapel Hill), and graduated the same year, 2003! Meeting a fellow Tarheel in Chicago is so rare, let alone one from my class. Very cool! Lucy (on the right) lives near the restaurant, so she walked and I got a photo of her with her cool shoes, instead of her bike. :) Cute skirt plus leggings plus sneakers = perfect early spring outfit. I passed a woman going the other direction who was riding a Dutch bike with flowing hair, carrying a baby on the front and a toddler on the back. It was so beautiful, I could have wept. She must be Dutch or something, although I would love to be wrong. Anyone know a regular Chicago mom who throws down like that? I was tempted to turn around and catch up with her to snap a picture, but figured that would be weird. I love that I ended up meeting her all this time later at my brunch, and I’m happy to learn that she is American! We also had a very special guest visiting from NYC, Kim of Velojoy, a “growing online resource for city cyclists and those who may be considering riding in the bike lanes for the first time,” written by an all-female team. Connecting with people from around the country and world through the love of bicycling is the best. I’m so glad Kim contacted me and and now I’m excited to visit New York again soon. Unfortunately, I did not get a picture of everyone who was there (Seri, I’m looking at you!). Of course, the women-who-bike brunch is also about food. My favorite dish at Ann Sather, a Swedish diner, is the Swedish pancakes with lingonberries. Yum! Our next brunch will be the first Sunday of May and we’re also having a happy hour next Wednesday, April 11. If you want in, email me at LGRAB@letsgorideabike.com and I’ll add you to the mailing list. Don’t be shy – we’re a friendly bunch! The next brunch will be April 1st – that’s right, April Fool’s Day. If you’re interested in joining us, email me at LGRAB@letsgorideabike.com. Is anyone out there organizing brunches or other get-togethers in their own cities? It’s such a great way to meet cool new people – highly recommended! Yesterday the Chicago Women Who Bike Brunch descended upon Haymarket Brewery in the West Loop. Haymarket is a great place for big groups and easily accommodated our table of 25. The food was delicious, especially for a brewery, and I enjoyed some of the best French toast ever. The mimosas each came with their own mini bottle of champagne! After a long and luxurious meal, we headed outside to chat and slowly unlock our bikes. The weather was partly sunny and 40 degrees, so there was no big rush. I always look forward to celebrating a new month with this great group of women! If you’re in the Chicago area and would like to join us, email me at LGRAB@letsgorideabike.com. Our next meet-up will be a happy hour this Thursday. 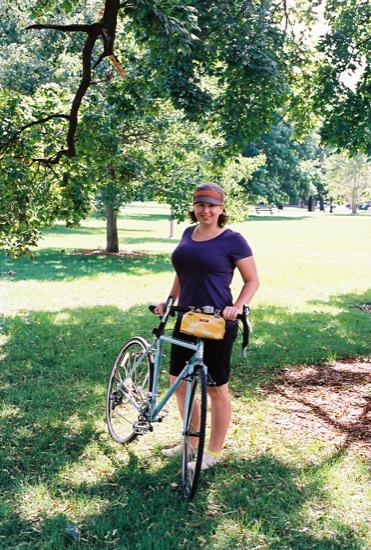 The first Women-Who-Bike brunch of the new year marked an excellent start to 2012! The lure of beautiful weather and the highly-acclaimed new restaurant Nightwood drew 23 women, including several first-timers. Because the restaurant was in Pilsen, about 8-10 miles from my house depending on the route, I met up with a group of six to bike together. Sunday morning is the best time to cycle and low traffic allowed us to ride side-by-side and chat most of the way. After a delicious meal, we all spent a good amount of time outside, chatting and bike-gawking. Martha took some photos for her fab blog, Bike Fancy. Other highlights: Purple! Carrie’s Fluevog boots and the skirt she made herself! Everything about this outfit with the headscarf, orange coat, lace slip, brogues, and leather bag! Comfortable windbreakers! A pink DeFietsfabriek and glam sunglasses! Letterman jackets, leopard scarfs, and chic black! The two of us biked home together along the Lakefront Trail, chatting the whole way, taking the 18th Street protected bike lane that I blogged about here. Anyone in Chicago interested in joining the monthly brunch group? Email LGRAB@letsgorideabike.com. Also – Chicago’s Critical Lass Ride is this Thursday. Who knew January would be such a great time for bicycling? 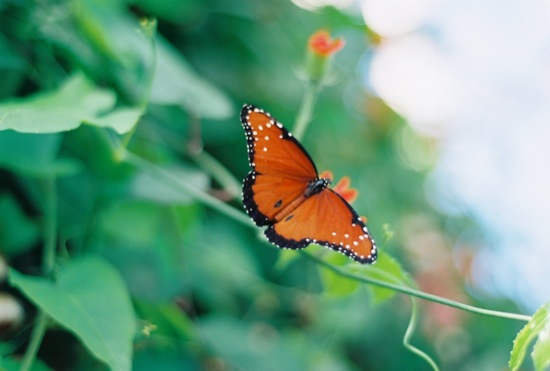 Take advantage of the freakishly mild weather! 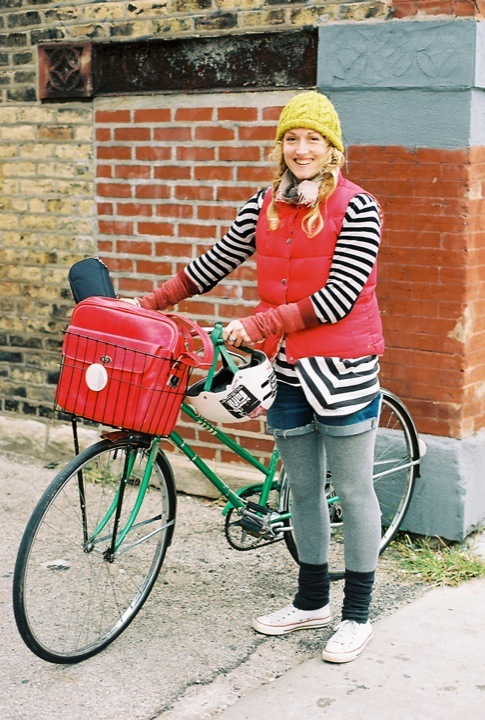 On Sunday, Chicago’s lovely bike ladies got together for the final brunch of 2011. The weather in Chicago is unseasonably mild and I was able to get by without a coat, wearing a sweater dress ($2 from Salvation Army!) and glittery Cynthia Rowley tights (a gift from Trisha last Christmas). About 15 of us met at The Southern in Bucktown and boy was it good! I had to get the fried chicken, biscuits and gravy (hey, I’m from North Carolina!). There was enough left over for yummy dinners on Sunday and Monday. For real, these cinnamon donuts with fruit and coffee dipping sauce looked amazing. After a leisurely meal, we headed outside for our usual bike talk. Maria, Samantha and Seri showed off their wintery white helmets. Catherine made a strong case for purple and green together. Martha’s bright red scarf and Samantha’s neon yellow gloves were great pops of color (visibility!) next to their black coats. And check out Martha’s new Yakkay helmet cover. Swoon! So cheerful on a grey winter day! After brunch and bike talk, some of us headed to the nearby Renegade Craft Fair Holiday Market. A perfect Sunday morning! I would like to take this opportunity to thank all the lovely ladies for coming together every month. I feel like our group is really something special and I’m so grateful for the friends I’ve made. Cheers to an excellent 2011! I must give thanks to Bleeding Heart Bakery and Cafe on Chicago Avenue. Even though they don’t take reservations, they accommodated our large group, plus the food was delicious and our waitress was super sweet. If you are in Chicago and interested in joining us for brunch, we meet on the first Sunday of the month. Email me at LGRAB [at] letsgorideabike.com to get on the mailing list for the details. Those of us who were not out of town for the Labor Day weekend met up for our monthly brunch on September 4. We enjoyed the back patio at bike-friendly Handlebar Bar & Grill, a group favorite. The weather was perfect and we savored what may have been our last outdoor brunch for 7 or 8 months. I love hanging out with this cool group of women! We meet for brunch the first Sunday of the month and for happy hour whenever. If you’d like to join us, email me at LGRAB@letsgorideabike.com. 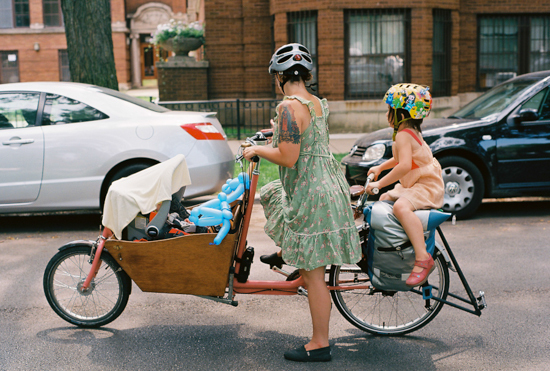 July’s women-who-bike brunch in Chicago on Sunday was a lovely little affair. (I believe most of our ladies were resting up after the annual overnight L.A.T.E. Ride.) We set up a picnic on the banks of a river just off a recreational bike path. Everyone brought a little something to share and there were lots of fresh berries, homemade pastries, and refreshing spiked drinks. The weather was a bit hot and there was a flat tire at the end, but nothing that the ladies could not handle. It was so lovely to meet new people and to see familiar faces! Are you in Chicago and interested in joining us? Email me at LGRAB [at] letsgorideabike.com. 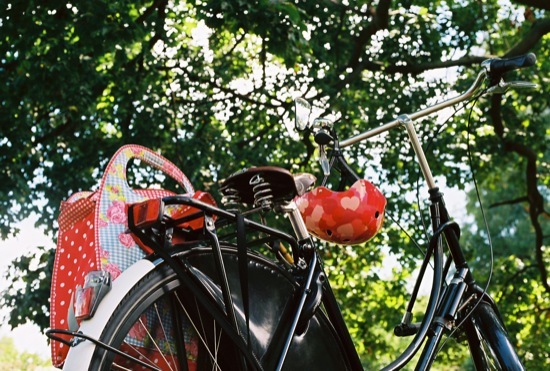 All women-who-bike (or are-considering-biking) are welcome!